Conch shells sounding from the roof announce the early morning puja at the Tibetan Buddhist Thiksay Monastery in Ladakh. We stayed in Thiksay during our recent visit to Ladakh; the monastery dates from the mid 15th century and, as can be seen from my photo below, is modelled on the Potala Palace in Lasa, Tibet. 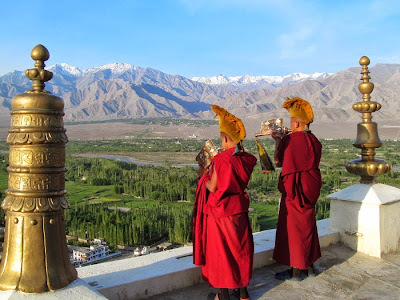 Thiksay, which is in the Indian state of Jammu and Kashmir, is 180km from the border with Tibet. 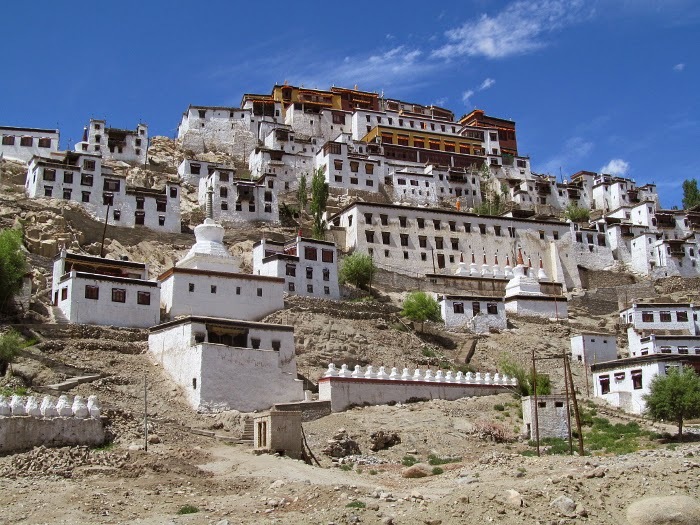 China's annexation of Tibet gives the link with the Potala Palace, which was the home of the Dalai Lama until he fled from Tibet in 1959, a particular poignancy. Peaks and Lamas is a book by Marco Pallis based on his travels in Tibet in the 1930s. Pallis was an acknowledged authority on Tibetan Buddhism, as well as a highly regarded early music specialist who founded the pioneering English Consort of Viols. When he died in 1989 aged ninety-four he was working on an opera about the life of the Tibetan saint Milarepa. More on Marco Pallis in Classical music's mighty and single cosmic rhythm. Also on Facebook and Twitter. Photos are (c) On An Overgrown Path 2014. These are fantastic pictures, pli. Hope you had a great time. One small quibble (as a Kashmiri I've got to ask if Jammu and Kashmir is an Indian state).